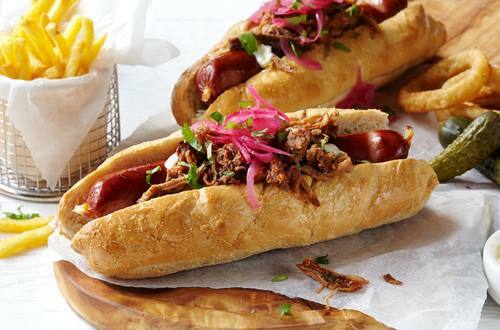 Cook up a storm with this delicious pulled pork hot dog recipe. Succulent and flavorful pork with creamy Hellmann's® or Best Foods® Real Mayonnaise that just melts in your mouth. 1 Combine onions with water in medium bowl; let stand 10 minutes. Drain, then arrange in 13 x 9-inch shallow pan and drizzle with lime juice. Cover and marinate in refrigerator at least 4 hours. 2 Heat pork in medium skillet sprayed with no-stick cooing spray over medium heat; stir in vinegar and ketchup and cook 3 minutes, stirring frequently. 3 Spread buns with Hellmann's® or Best Foods® Real Mayonnaise, then add hot dogs. Top with pulled pork, then drained pickled onions. *Grill, broil, boil or pan-fry hot dogs. *For 10-Minute Pulled Pork Hot Dogs, simply arrange cooked hot dogs in hot dog buns spread with Hellmann's® or Best Foods® Real Mayonnaise. Top with heated prepared or leftover cooked pulled pork and omit pickled onions. See nutrition information for fat, saturated fat, cholesterol and sodium content.